The lazy days of summer pose a special challenge for music parents. With school and regular music lessons on hiatus until the fall, it can be hard to persuade youngsters to continue to practice their instruments without the prod of needing to prepare for a lesson or a school ensemble rehearsal. If there isn’t a certain amount of vacation practicing, however, some of the musical gains children made during the school year may begin to melt away. Many music parents solve this problem by enrolling their youngsters in summer music programs. These can include music day camps and workshops sponsored by local music schools, arts organizations, Suzuki associations, or recreation and education departments. For older youngsters, there are sleep-away camps that include music-making in their activity line-up. Advanced students could try out for some of the more high-powered audition-only summer music festivals. Making music with other kids is one of the best ways to encourage practicing at any time of year, giving youngsters a chance to make musical friends and let positive peer pressure work its motivational magic. Summertime music programs have a special advantage of letting kids be “on their own . . . learning from kids—not from a parent—how important practice is,” says Ohio music mom Ann Turner, whose daughter attended music camps as a youngster and is now a professional French horn player. If signing up youngsters for a summer music program isn’t possible this year, there are other ways to inspire summertime music-making. Below are a few ideas from veteran music parents who, like Ann Turner, share their suggestions in The Music Parents’ Survival Guide. 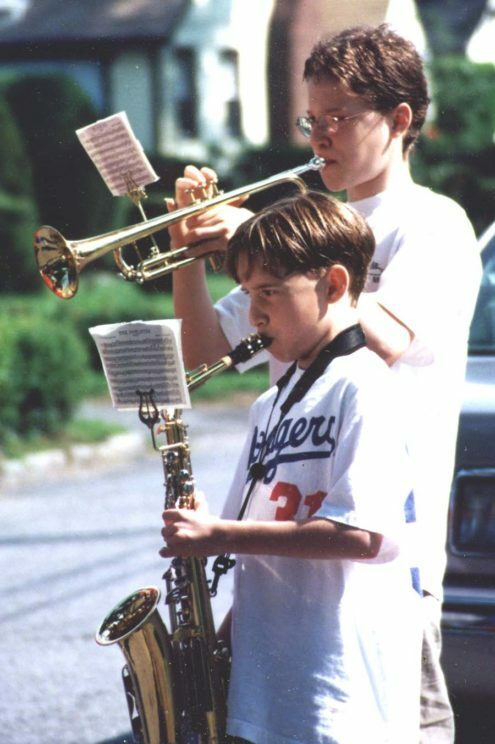 The author’s sons as youngsters, taking part in an informal neighborhood Fourth of July parade. Photo courtesy of the author. Concertgoing. “What I say to any parent that wants to know the best approach to get kids interested in music: There’s nothing better than exposure,” says Ellis Marsalis, father to a quartet’s worth of jazz musicians, including trumpeter Wynton Marsalis. The power of attending a live performance can spark kids’ interest in making music themselves when they get home. Summertime concerts have the added attraction of frequently being cost-free, such as the performances that local bands and orchestras present in public parks, as well as outdoor drumming circles that take place in some areas. In addition, if it isn’t possible to sign up for a local summer music camp or program this summer, attending the program’s student concerts offers an opportunity for families to check out the program to see if it might be a good choice for the following summer. Fun music. “Music should be fun for kids. That is the key,” says Marin Alsop, a music mom and conductor of the Baltimore Symphony Orchestra. Lesson-free summers offer a chance to explore new ways to have fun with music. Without the pressure of preparing a particular piece for a lesson, kids can branch out a bit and download different kinds of music that they might want to experiment with on their instruments. “We got music for pieces they could play on their own for fun, like Star Wars music and the Pink Panther theme,” says Oregon music mom, Diane Cornelius. Other families added elements of fun to whatever pieces youngsters were practicing by encouraging them to make up stories to go with the music, as if the music were a movie’s soundtrack. For young children, scavenger hunts can add fun to practicing. A parent can hide index cards around the house (or in a basket) for a child to find with the names of songs or exercises to practice. Youngsters could also do some improvising to make up their own tunes, and then learn how to write them down, using the free introductory versions that are available for such music notation software programs as Sibelius or Finale. Rewards. When her son was young, Marin Alsop used “reward minutes” that he could cash in on weekends to play Wii video games, as a way to reward him for the time he spent practicing. Many parents have used various kinds of reward systems when their children were young. Annette Radoff placed a cotton ball in a jar each time her daughter Elena Urioste (now a professional violinist) did a good job practicing. “When it was full, Elena would choose an activity as a reward, like watching a movie, going on an outing, or baking things together,” says this Philadelphia-area music parent. Education experts say that rewards—if used in moderation—can be effective motivators. Role Models. Parents who play an instrument can model good practice behavior by fitting in some practice time themselves, even during the dog days of summer. Baltimorean Thanh Huynh, inspired by her daughter’s musical interests, started playing piano again after a multi-year gap. “My daughter could see that I practice what I preach with regards to practicing,” says Thanh Huynh. “Music should enrich everybody’s life”—even a busy music parent’s. Featured image credit: “Fast musical notes on a music sheet” by Horia Varlan. CC by 2.0 via Flickr. Amy Nathan is an award winning author of several books on music—The Music Parents’ Survival Guide: A Parent-to-Parent Conversation, and two earlier books for young people, The Young Musician’s Survival Guide: Tips From Teens and Pros and Meet the Musicians: From Prodigy (or Not) to Pro. A Harvard graduate with master’s degrees from the Harvard Graduate School of Education and Columbia’s Teachers College, she is the mother of two musical sons, one a composer and the other a saxophone-playing political scientist. 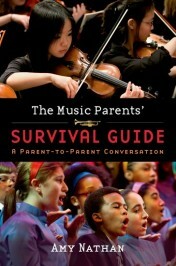 The parents featured in the article above were interviewed for The Music Parents’ Survival Guide. I like to use summer as a time for duets with students. If they bring a family member to play a duet with, I reward them with popcycles.